I bake homemade challah every Friday morning. We eat it at dinner along side the Shabbat meal, and then for breakfast the next day, slathered in cream cheese. Sometimes we eat it all, but often a small amount is left. Rather than throw out homemade bread, I put the extra bread in the freezer. 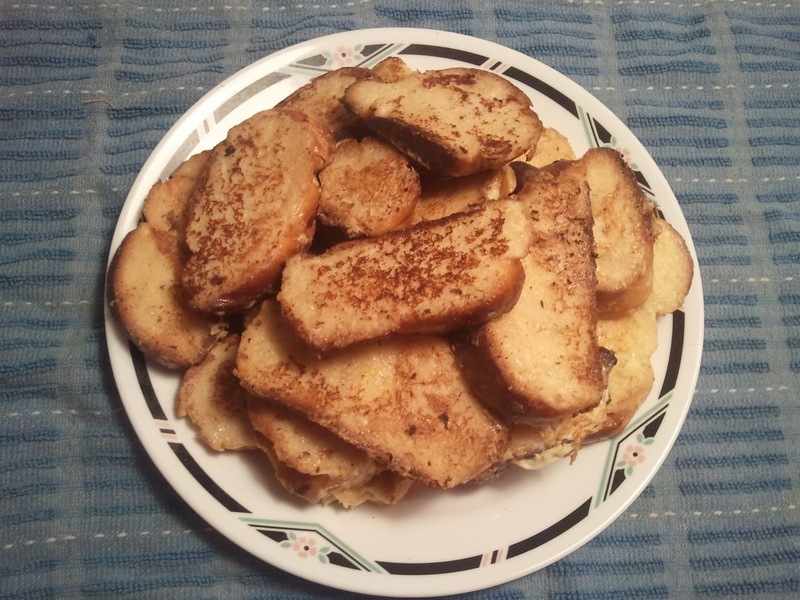 After several weeks, when I have enough leftover bread, I make French toast for dinner one Saturday night. A couple of weeks ago, I decided to do just that. Looking in the fridge, I noticed that I still had a little bit of Bailey's Irish Cream coffee creamer that Publix had paid me to take out of the store several weeks earlier. So I decided to incorporate the coffee creamer into the French toast. It gave ordinary French toast a delicious flavor! Remove the ends of the bread and cut crosswise into 1-inch slices. Heat butter in a frying pan over medium heat. Add 4-5 bread slices. Cook for 2-3 minutes, or until the bottom is starting to brown. Flip bread over and cook for another 2 minutes. Remove to a tray. Keep slices warm by putting the tray in the oven on low heat. Continue until all the bread slices have been cooked, adding more butter if necessary. Your French Toast looks delicious. Hope you are having a great weekend and thank you so much for sharing your awesome recipe with Full Plate Thursday. I love it what a cool use for Bailey's. Thanks for sharing your french toast on foodie friday. OMG I love baileys, how can I not have ever thought to have used it in french toast. Brilliant idea! oh goodness that just sounds amazing! my husband works at a bakery that serves challah once a week, and I LOVE making french toast with that stuff the next morning. This sounds really good. I love homemade bread in French toast. That sounds so yummy and delicious. Thanks for sharing. I am pinning it now. Your French Toast sounds lovely. I really like the idea of using the Bailey's. I might even be really decadent and use the actual liqueur as I have some leftover from Christmas :) Thank you for sharing such a great idea with The Gallery of Favorites! Wow, this looks so yummy! I'm going to have to make this for breakfast for the hubby! This looks brilliant! Thank you for sharing this. Ohhh this sounds amazing! I have never thought of doing something like this, but I will give it a try. Thanks for the Post, Picture's and the Recipe! I cannot wait to try!